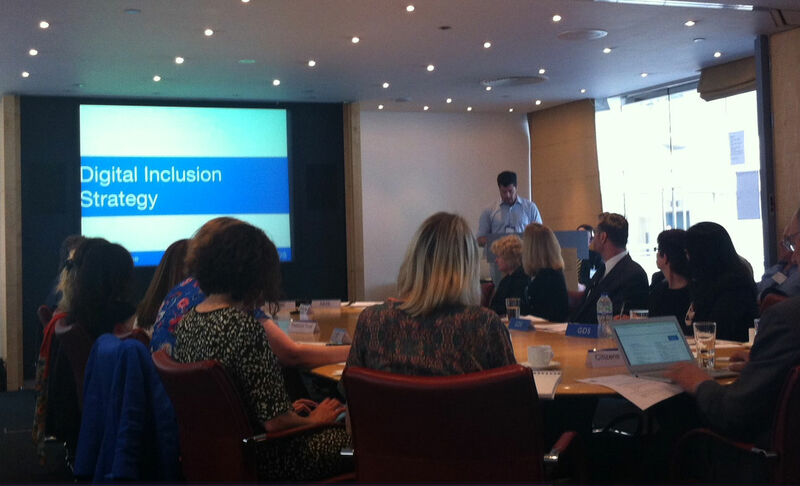 The Digital Inclusion Team recently hosted the first meeting of the Digital Inclusion Delivery Board, with members of the Digital Inclusion forum also in attendance. This was a really important event for the team now we are moving into the delivery of our strategy - the real work starts now. 47 partners who have all signed up to the UK Digital Inclusion Charter make up the Digital Inclusion forum. Representatives from seven of those organisations sit on the Delivery Board, including organisations from the voluntary, private, local government sectors and digital skills providers. The board also includes a representative of the academic community. It is co-chaired by Go ON UK and GDS. Our team will be collaborating with the Delivery Board to work on a programme of activities and deliver the actions laid out in the Digital Inclusion Strategy. The board will also set up an initial two working groups, one will coordinate research activity and the other will explore how we can increase the digital skills of SMEs and VCSEs. Members of the Digital Inclusion team and Go ON UK gave presentations about work that is taking place and future plans. Go ON UK’ presented their vision for the UK to become the world’s most digitally skilled nation. They want every individual, small business and charity to have the skills and confidence to benefit from online services and opportunities. Their regional roll out programme is one way in which they intend to achieve their goal. Go ON North East and Go ON NI have both been launched in the past few months, and in June, Go ON North West will kick off. Members from Go ON UK gave an overview of their key Go ON North West objectives which included reducing the proportion of individuals, small businesses and charities without Basic Online Skills in the North West of England substantially, by at least 25% by July 2015 and building on the success of existing Basic Online Skills programmes in the North East of England and NI. Go ON UK also highlighted digitalskills.com as a way to help everyone in the UK get connected. Support the regional rollout programme and promote regional activity and sign the digitalskills.com charter at digitalskills.com/charter. One of the main focus points of the meeting was to draw out the work that is already planned or underway on delivering on charter actions. We ran a workshop which involved attendees brainstorming and identifying activity their organisations already had planned or any suggested ideas that our partners could take forward. Each group fed back their discussions to the wider group and they provided details on how other signatories could support those actions. We will be providing updates on these actions and the work taking place in future blog posts!